It all started with admitting that the freight shed I built over the Christmas break just doesn't work very well in Emsingen. It's too small for the traffic, and amount of goods it would be supposed to store. I started looking for another location I could put it at. I needed a spot with a track, road access, and a purpose. Thus the freight shed became an agricultural supply. The only available spot on the layout was at the end of the Kopper Furniture shelf. I had a location and a purpose for the building, now I needed the tracks to get there. The simple track arrangement on the shelf became a bit more involved. Kopper Furniture continues to be a large operation and will be represented as a modern half-relief building against the backdrop. There will be 3 numbered doors to spot cars at. 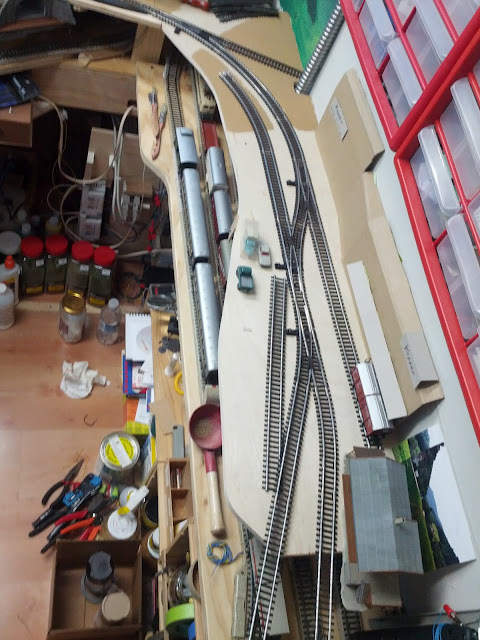 The track next to the shed extends all the way into the corner of the room (after I took the photo I also extended the shelf into the corner). The track next to it is a team track, and doubles as access to the sawmill track in the back. All of this adds a bunch more freight car spots, and it opens up the possibility to originate a switching job out of Talheim, even exchange cars in Emsingen and return. I really need to get more locomotives operational now.